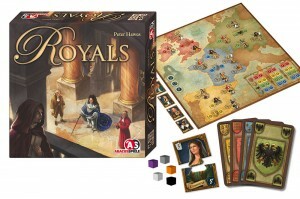 Royals is a new eurogame by the designer of last year’s Triassic Terror and the excellent Francis Drake too. The board shows 4 European countries and each has various titled positions (Baron, King, etc.) which players can earn. Each turn, you draw 3 country cards, or 1 country and 1 intrigue card. Similar to the game mechanic in Ticket to Ride, country cards are drawn from 3 face-up cards or unseen off the draw deck. After drawing cards, you can choose to play country cards to take control of a position – each position shows how many cards matching the relevant country are required. If another player already holds the position, you must play an intrigue card that shows the country as well (each intrigue card shows 2 different countries). When taking control of a position, you place a cube of your colour on that position on the board (moving any previous owner’s cube to the city space next to the position). In addition, any player that takes control of a position also places a cube on the tile next to the board that shows the same position – these cubes accumulate throughout the game. There are 3 scoring moments during the game each triggered when the country card deck runs out and victory points (VPs) are awarded to the current owner of each position. However, there are also lots of bonus VPs to be earned during the game by the first player to occupy any position in each city, the first players to have a cube in each city, and players who have a cube on every position tile by the side of the board. After the third scoring moment, the game ends and there are final VPs awarded to each player that has the most cubes on each position tile by the side of the board. The player with the most VPs wins. Royals seems to be a fairly simple eurogame but with lots of different ways in which to use your cards to score VPs by occupying different mixes of positions. Players’ choices are very direct, i.e. you know you can use x cards to take y position and displace z, which seems very much in the style of Peter Hawes’ other game designs. So, whilst simple, I think it should be a game that gamers will like. There should be plenty of player interaction as players displace each other from positions so will probably be fairly brutal. You’ll need to watch other players to see which colour (country’s) cards they are taking so you can watch out for who may be trying to displace you (although you’ll still need to work out where they may try to replace you too). I like the idea that you can’t actually block anyone who wants to replace your cube, so taking cards to deny other players, or to replace their cube after they replace yours, is your main recourse. Having scoring moments when the deck runs out is interesting as it means players can/will manipulate when these happen, as players must draw 1 or 3 country cards each turn. I can imagine players suddenly making a flurry of grabs for positions and trying to hasten the scoring as the deck runs down, and/or trying to delay the scoring and reclaim lost positions. This entry was posted on Saturday, September 27th, 2014 at 11:17 pm	and is filed under Board Games, Essen Spiel 14, Preview, Royals, Spiel 2014. You can follow any responses to this entry through the RSS 2.0 feed. You can leave a response, or trackback from your own site.